The kitchen can be one of the trickiest rooms in the house when it comes to floor selection. You need a floor that will stand up to high traffic, lots of activity (and mess) and able to handle spills and water. That can be a tough list to meet. Wandering the aisles of a big box store isn't likely to point you in the right direction. Stop by Kermans showroom on the north side of Indianapolis and our design experts will be happy to help you select from a wide variety of floor coverings that are just right for your kitchen. 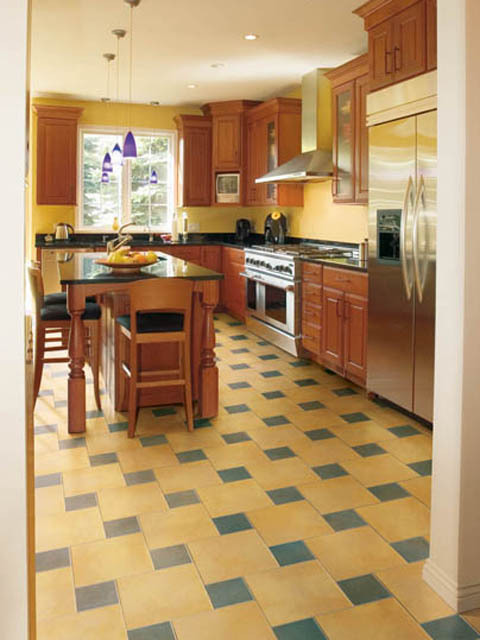 What are the best options for a kitchen floor? Tile: One of the top choices in floor for any kitchen. Tile is naturally water resistent and if you choose a glazed option it will virtually never show wear. There are quite a few options in tile, from the type of materials - think ceramic, glass or even metals - to glazed vs unglazed. Spend some time considering the different types and how each will fit in with your current design. It's hard to go wrong putting tile in your kitchen. Review our tile buyer's guide to learn more. Hardwood: Yes, wood in the kitchen. Keep in mind that over time you will have wear patterns in your floor but that lends a certain charm to the right style room. Hardwood also tends to be easier on your legs and back which is a nice bonus for a room where the cook spends a lot of time on their feet. Not all hardwoods are the same, so take some time to investigate your options and determine the appropriate level of hardness. Check out Kermans hardwood buyer's guide for more info. Cork: Cork floors are regaining popularity. These floors are an environmentally friendly choice because they are made from a renewable resource. Cork tends to be quite durable by nature and it is also very comfortable in rooms where you'll be doing lots of standing. No matter what you decide to do, Kermans has flooring for you to consider. Stop by our showroom to get a hands-on feel for your options. We look forward to helping you make your kitchen a comfortable, functional room for years to come.